Annie here! I'm excited to welcome Courtney Walsh on Seekerville today! If life were as easy as a Disney movie, all of us would’ve figured out how to “let it go” after Elsa’s stirring and emotional power ballad. It feels like something we ought to know how to do, especially once we reach a certain age, but letting go isn’t as easy as the song suggests. When I began work on my upcoming novel Just Let Go, I prepared with that in mind—the fact that so many of us (myself included) struggle to let go. I’m not sure why it’s human nature to hold on to things, but whether it’s tickets from your very first concert (New Kids on the Block) or a hurt that happened ages ago, we are collectors. And some things we’re collecting are doing more harm than good. Here are five things to let go of today. Okay, this one’s a bit obvious. After all, it’s biblical to forgive and move on. But just because something is obvious doesn’t mean it’s easy, and letting go of the way we felt when someone hurt us is no small feat. We all have different methods for dealing with our pain, and when someone hurts us—especially when they don’t apologize—it can eat us up inside if we let it. We can’t let it. The hurt then compounds and becomes something even more damaging. 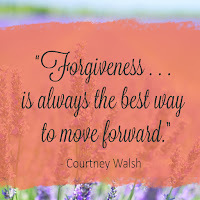 Forgiveness, though sometimes hard to give, is always the best way to move forward. I think of regrets as grudges we hold against ourselves. It’s so easy to replay our mistakes on a continuous loop in our minds, but friends, this is a path to destruction. We all make mistakes, but dwelling on them is no way to live. Your past doesn’t determine your future unless you let it. Choose to forgive yourself, to ask for forgiveness if necessary, and make amends—and then move on as best you can. If God is love and love keeps no record of wrongs, then we shouldn’t either. You know how it goes. You’re expecting something really amazing to happen—a job or promotion you’ve been waiting for, a proposal from a significant other, a pregnancy, a positive report . . . the list goes on—and that thing that’s supposed to change your life never comes. They hire someone else. He decides it’s time to move on. You never see that purple “plus sign.” We all have disappointments. We all have those things we were counting on or hoping for that don’t come through. But if you stop and look back, it may be that the closed door was actually there to guide you on your path. What if God has a different job, a spouse more suited to you, better timing for a pregnancy? These unmet expectations can turn into bitterness so easily if we cling to them with both hands. This is when “letting go” becomes synonymous with “trusting God.” Because even when it’s hard, he’s still got our very best interests at heart. Some of us struggle with this one more than others do. Some of us want to be in control of every aspect of our lives. The heroine in Just Let Go is neat and orderly and likes everything in its place—but life doesn’t always allow for that. Sometimes we have to let others take the lead. 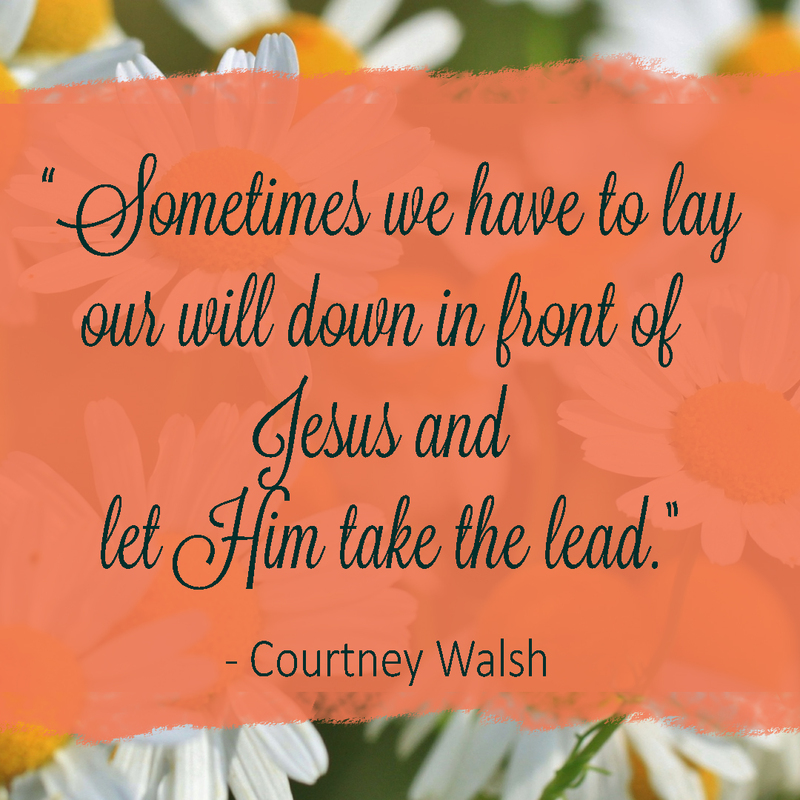 Sometimes we have to lay our will down in front of Jesus and let him take the lead. Life is about the give and take, and needing control in every situation is a sure recipe for disappointment. Control freaks may not find it very easy to give up their own will. Start small. Let someone else choose the restaurant. Let your kids load the dishwasher and don’t rearrange everything before starting it. Then move on to the bigger things one day at a time. Our world is full of images and phrases and people who will try to make us feel like we are not good enough, smart enough, pretty enough, skinny enough. I thought this would go away after high school, but I’m forty-two and I still battle these feelings. Perfection is unattainable. 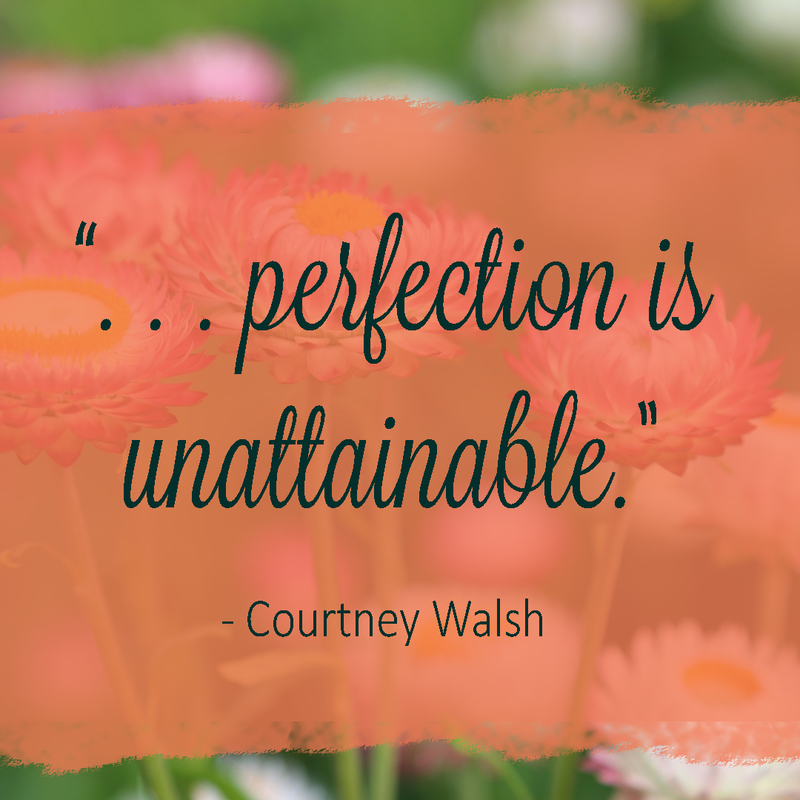 It’s such a no-brainer, and yet it bears repeating—perfection is unattainable. Why, then, do we strive for the perfect home, the perfect marriage, the perfect career, the perfect body? We have this standard (set by whom?) that we think we need to attain. Friends, it’s time to let go of that. We will never be perfect. Life will never be perfect. And you know what? That’s okay. It’s not meant to be. Instead of striving for perfection, strive for goodness. Strive for happiness. Strive to please your heavenly Father instead of the strangers on the internet. And revel a little in the messiness of life . . . after all, that’s what makes it fun! Letting go, in all of its forms, is tricky and challenging, and it takes practice. Day by day, little by little, if you find ways to let go of these things, life will be fuller and more relaxed. Can you think of one thing you’re holding on to that you could let go of today? Maybe we could take baby steps together? Courtney Walsh is a novelist, artist, theatre director, and playwright. 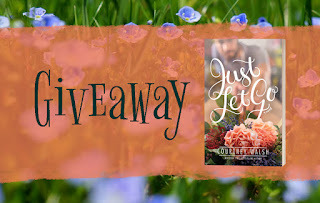 Just Let Go will be her eighth inspirational romance novel. Her debut, A Sweethaven Summer, hit the New York Times and USA Today e-book bestseller lists and was a Carol Award finalist in the debut author category. A creative at heart, Courtney has also written two craft books and several full-length musicals. She lives in Illinois with her husband and three children. 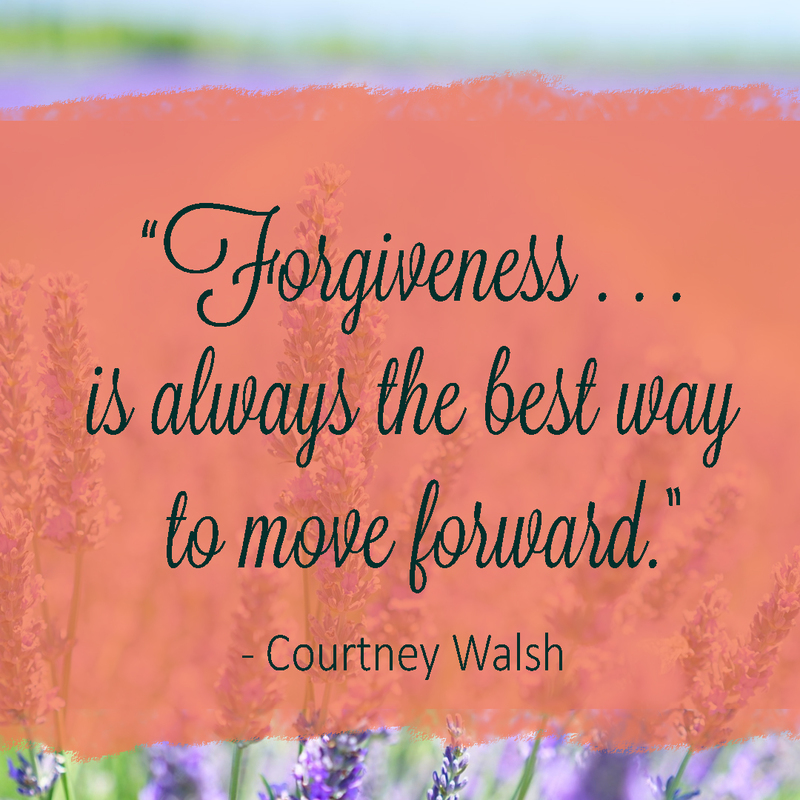 Visit her online at www.courtneywalshwrites.com. For Quinn Collins, buying the flower shop in downtown Harbor Pointe, Michigan, fulfills a childhood dream but also gives her the chance to follow in the footsteps of her mother, who owned the store before leaving town twenty years ago and never looking back. Completing much-needed renovations, however, while also preparing for a prestigious flower competition with her mother as the head judge, soon has Quinn in over her head. Not that she’d ever ask for help. Luckily, she may not need to. Quinn’s father and his meddling friends find the perfect solution in notorious Olympic skier Grady Benson, who had only planned on passing through the old-fashioned lakeside town. But when a heated confrontation leads to property damage, helping Quinn as a community service sentence seems like the quickest way out—and the best way to avoid more negative press. Quinn finds Grady reckless and entitled; he thinks she’s way too uptight. Yet as the two begin working together, Quinn sees glimpses of the vulnerability behind the bravado, and Grady learns from her passion and determination, qualities he seems to have lost in his pursuit of Olympic gold. When a well-intentioned omission has devastating consequences, Grady finds himself cast out of town—and Quinn’s life—possibly forever. Forced to face the hurt holding her back, Quinn has to choose: let go or risk missing the adventure of a lifetime. You can find out more and to purchase the book on Tyndale's website HERE. So glad to learn about your books. I've long felt that writers with live stage experience are far better at rewarding readers for reading, page after page, on an on-going basis. There is nothing like getting immediate audience feedback to make a writer understand that the story is about the reader's constant reaction and not just how readers like a book once they have read it. The question is always: how will the reader react to this sentence? Is it real? Will it hold their interest? I just downloaded your "A Sweethaven Homecoming" and will start reading it in the morning. I want to hear your voice for the tell tale signs of stage experience. Now, on topic, as far as 'letting go' goes, I have a theory that one could just replace the problem with an incompatible feeling or action. I think this works well with bad habits. Fighting them often gives them added reality. Don't deny them or try to drive them out but rather ignore them. For a bad habit, develop a good habit which is incompatible with the old bad habit. Don't rely on will power. Let the good habit steal the power away from the bad habit. Deny negatives any power or place in your mind. I feel this is the rationale behind 'not resisting evil' and for turning the other cheek. Instead of striving for perfection, strive to aim high for best results. Let unmet expectations serve as motivation for future success. Instead of grudges and regrets allow these events to serve as learning experiences that open new opportunities for success. As for control, join a little theater group and take direction as you experience a new craft. Rejoice in the experience of being another's creation. Know first hand what it feels like to be a character in a book. See writing from both sides. Just a few late night ideas stimulated by your thought provoking post. What do you think? Do you feel you can tell when another writer has had live stage experience? I think it is easy. Hi Vince! Live stage experiences does bring a different perspective into writing, doesn't it? I'd imagine those we deemed are 'perfectionists'may find the concept of letting go hard to grasp. I think there's a thin line between striving for perfection and towards high standards because where is that threshold? Where does it end? Yet, without striving towards it, what is the point? Letting go sure is trickier than said. Vince, I love this quote: "Don't rely on will power. Let the good habit steal the power away from the bad habit." I appreciate your thoughts here too about letting go. It's so, so hard, but sooo important!! Welcome everyone! Hi Courtney! Thanks for dropping by Seekerville! I've got some virtual (and real) cookies, breakfast muffins and danishes! Coffee too. Dig in and enjoy y'all! Courtney, this resonated with me. I have had to let go of a lot of things lately, from beloved shops closing to the death of a close friend at only 65. From little things to huge things. Part of it is getting older -- the bodies of the people we love wear out, the treasured institution completes its run. But it's true at any age and stage. Life, at least in this life, IS about letting go. Because this one is a rehearsal for the next one. Kathy, I'm so sorry for your losses. Yes, change is terribly difficult. And losing loved ones is distressing, especially when they're so young. And I think it goes in seasons, don't you? Sometimes I definitely feel like God is giving me more than I can handle. :( I'm sorry you're struggling, but so glad this post resonated with you! And you're so right... this life is a rehearsal for the next one! Mary, if you're on today, I did notice that the shirt had only one sleeve. I just didn't understand why you were wearing it. Hi Courtney, What a great book title, it says so much in so few words and the cover is beautiful! Even though "perfection is unattainable" this list IS perfect, all important things to ponder and let go of. I'd love to read your new book, please enter me in the drawing, thank you! Hi Tracey! Isn't the title and cover just perfect?! I also love the simplicity of the 3 little words that packed quite the punch. 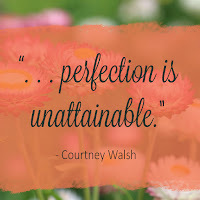 Let go of perfection? Really? I've been working on that one awhile, still pretty much unsuccessful. And yet, trying to be perfect causes me way more pain than just 'letting it go.' Great post Courtney. Thanks for being with us in Seekerville today. Cindy, I think I've been working on that since like forever! LOL. Thank you! Yep. I'm there with you. Cindy, congrats on your latest news! Don't want to spoil your thunder...but sending hugs and cheers! Gosh, Cindy, me too...and I notice certain areas of my life I strive for it more than others. I pretty much have to stay off Pinterest so I don't feel like a terrible wife/mom/woman with a house that's not up to snuff! Oy! I need to get that in check! Courtney, welcome! We're so glad to have you today! I admit I'm a control freak and a perfectionist. I'm so bad that it can paralyze me sometimes. I love your suggestion to start small! I'll join you on that journey to let go. Me too, Missy! Letting go of control is pretty scary, but I've learned a lot about it when it came to the planning of CFRR! Thank you so much for the warm welcome, fellow control freak and perfectionist! ;) I am just like you in that, and I am trying to take my own advice!! Courtney, I love this post. This is one of few I was able to read when I didn't have a super-limited amount of time to read it. I'm sitting here in a screened-in porch of a cabin. My husband and I are relaxing after a taxing weekend. After 22 years of serving in the Navy, my husband is retiring. His retirement ceremony was Sunday. In the months leading up to this, neither of us were ready to "let go". We both loved the military in different ways, how it made us stronger people, and how I became a proud military wife. I loved your section on "regrets". Over the past few months, I have had my share of regrets. The biggest one is wishing I had been able to go down to where my husband was on active duty to see him and meet the great people he had come to know. However, we never had enough money to have me fly down there. A few of my friends and the go-to people I talked to in this transition told me that I could choose to hold on to those regrets, or to make some "lemonade" out of them in this new chapter of my husband's and my lives. I have so much time right now, I even had time to read what your book was about. I would really love to read your book. All I have to do is pray I win it (lol). Keep up the great writing, Courtney! Hi "All Things Hard Rock" (Julia?). I do love the "Regrets" part on Courtney's list as well. Thank you for sharing your story, and what great advice your friends said about turning the regrets to "lemonade". I personally love what Courtney said, "Your past doesn’t determine your future unless you let it." May your future be filled with great stories! All Things Hard Rock, thank you for your service. Yes YOU, military spouses serve, too, for your service and your husbands. And the screened in porch and TIME sound wonderful. You might get tired of it, but until then ENJOY! Waving to "Hard Rock!" My hubby retired from military service some years ago. It is a transition. Hoping you find new energy and enthusiasm about the next stage of life God has in store for both of you. Hugs to your hubby. Thank him for his service to our nation. God bless our military heroes...and the people who love them. Hello, Courtney! What a wonderful post! Great job. It spoke to me...even the part at the end of the blurb for your books about discussion questions. I really do need to start the work on a Bible study for my books, especially Crawling to the Light and Wise Turned Foolish. That means I really need to get more serious about setting goals and sticking to them. Hi Faye! I personally love discussion questions at the end of books. It really works great to understand more about the story, and a great way to chat with fellow booklovers and friends about. I need to let go of worry and fear. Those would be the biggest for me. This was a good post, Courtney. Your book looks good! My sister told me that she is just a chronic worrier and if there is nothing to worry about, she makes something up. So she's set aside 15 minutes a day to WORRY, then she tries to not worry the rest of the day. I don't know if he system works but it was funny. HAHAHHA. MARY, that is absolutely hilarious and BRILLIANT. I wonder if it really is that easy??? I once heard "Worry is faith in the enemy." That's stuck with me for a lot of years... I don't want to have faith in the enemy...and yet, I really struggle with anxiety and worry. It's a constant battle to calm the mind, isn't it?? I try to give myself grace in the hard times, but even that can be tricky. Praying you find peace too!! Hi Courtney! I love these points! I'm prone to setting unrealistic expectations for myself then becoming overwhelmingly paralyzed when I don't measure up. It's something I have to check myself on constantly! Looking forward to reading your book and thanks for visiting us at Seekerville! Isn't Courtney just SPOT ON with these 5 things??! I mean - WOW! Almost like she's saying to each of us individually and personally! LOL. THANK YOU< my friend!! <3 MUAH! YES. I am the exact same! Paralyzed when I don't measure up. :( Why do we do this to ourselves?? Beth, I do the same thing. I wish I could be more easy going in that regard. Many thanks for your post, Courtney. Sound advice to follow at any stage of life. Pretty cover on your latest book. Regrets: I have these flashes of stupid stuff I've said and done...tons of it left from HIGH SCHOOL. And I cringe to think I said or did that!!!! Whatever it was. Once, on Dr. Laura, she said those flashes, those twinges of regret, are the sign we are good people. She said bad people do NOT have twinges. They spend no time worrying they hurt someone or were rude to someone or made a fool of themselves. PS I WANT to believe this. I think that makes perfect sense!!! I mean, yes, people who don't care, don't feel that regret, right?? I think the tricky thing is not letting our regrets paralyze us or keep us from moving forward. Oy! I wish I was better at that!! Also, aren't you so glad we didn't have social media in high school?? In this case, unmet expectations were sort of a bonus. LOL!! So does that preChristmas expectations game you played work?? hahahah I need to try this!!! As for grudges, most of the people I'm mad at really deserve it!!! On the other hand it reminds me of that old saying that hatred does more damage to the person who hates than the one who is hated. Or...holding onto hate is like drinking poison and expecting someone else to die. And many of them never apologized...that's the hardest part. But these quotes are SO good!! Just the reminder we need! You're in good company! I've got my hand up too! So #5 kind of smacked me between the eyes. It's something I need to remember on a daily basis. Thanks for the tips and congrats on the new release! Ughhhhhh. Walking into this post, I was like, "I'm good." And then, I read through #2-#5! Oy. I particularly struggle with unmet expectations. The world would just make so much more sense if people just met my expectations! Ahahaha. This was a wonderful post! It doesn't matter what age you are, you still need to let go of unmet expectations and comparison. I can't wait to read this new story from Courtney! So true Carrie! So true. I loved your list of things to let go of! All of them boil down to one basic thing, don't they? Trust God and obey Him. For some reason, that's hard for us to do. It seems like it should be easy-peasy! YES! Trust God and obey HIM! =) Let go and let God! Yes! They sure do!!! So much easier said than done! Happy release day to you too, PAM!! HAHAHAH. "And at the end of the day, there's no greater story I could be writing than the one I'm living. <3"
Lovely post, Courtney. So glad you could be with us on Seekerville today. Congrats on your writing success! Yay! Thanks Debby!! I'm thrilled Courtney is on Seekerville too! Let it go, what’s that? **gasp** just kidding, I don’t live under a rock! This post is so applicable to ever one of us. They all pertain to me. The worst for me is grudges. This girl can hold a grudge like there is no tomorrow. I know, I know....forgive and forget. Trust me, I’m working on it! lol. I need to remind myself as well! Amen! I find myself having to let go again and again of things I had already let go of. Thanks for this reminder. Ditto Amy. Me too. I love reminders we get in books and chats! Hi, Courtney and welcome to Seekerville. I love this post and, I'm happy to say that the only thing I'm holding onto is a few extra pounds. Oh, wait. I'm not happy about that. Just that I'm not holding onto any of those things you mentioned. They do bog us down and stop us from living the life God intended for us. Thank you for the lovely reminder. Wonderful post. I continue to work through all of those to some extent. I am glad our God does not leave us in that state. I am glad He continues to change us. I'm in the middle of a hurtful situation right now that is going to be very hard to get over. I know there is no way I can do it without God's help. Thanks for sharing. I'm sorry to hear Linda. Sending prayers and hugs. Hey, Courtney, welcome to Seekerville! What a lovely post. Just absolutely lovely, and huge thanks for being with us today! That lesson in grudges.... that's one of my favorite things, to let it go and let God handle things. The Serenity Prayer is my BFF. I read your post and realized that it resonated with me also. I've "let go" of several things in the last month and boy do I feel free! I've never held a grudge or wanted to be perfect but the other things I've done in different degrees! We all can learn from your post! Thanks! Totally agree. Great post here. Thank you for dropping by. Thank you, Courtney. Reading where you wrote "I think of regrets as grudges we hold against ourselves" really struck me. I would never have thought of it in that way. That is so freeing. So true. I'm learning and I love these reminders! Thanks for stopping by Stephanie! I love finding author I have not read yet and Courtney walsh I a new author for me. Exciting. YAY!! I love the thrill of a new author too! My first book of Courtney's is Change of Heart, and I haven't yet stopped since! You'll love her and Just Let Go is FABULOUS! I am late chiming in today. It has been an adventurous day. I was slowly marking things off my to do list. Knowing I would be gone to my card making class this afternoon. I sliced my vegetables and quickly made a bacon tomato cucumber sandwich while frying some squash. Everything else was ready when the squash finished. Lifted them out of the frying pan onto my plate and went into the living room to eat. I had an old episode of NcIS on. I had just eaten my last bite when there was a fire on the episode, I wondered why there was smoke in my living room as well as on the TV. I began to cough and wheeze. All of a sudden my foggy brain comprehended the smoke was real. I jumped up and ran to the kitchen. Removed the smoking pan off the stove. turned it off. Turned on the ceiling fan etc, By this time every corner of my house was full of smoke. The smoke detector never went off. I was by this time throwing up along with the coughing. I talked with my girlfriend on the phone and she suggested I call 911 to find out how to get the smoke out of the house. Of course they sent 3 trucks and an ambulance. After being on a little oxygen, I was fine and did not need to go to the hospital. One of the fireman checked the smoke detector which was 14 years old He said it was out of date so said if I would get one, he would swing back by to put it in for me. I can so see this going into a book. the house still smells of smoke. I love looking on life as an adventure but I think I could do without this kind of excitement. I hope everyone had a better day. WOW Wilani! I'm so glad you're okay! And such a nice fireman! This would be quite a lovely scene in a book for sure. Have you read Tina Radcliffe's "Safe in the Fireman's Arms"? I hope you'll get a peaceful reading day this week! No more fire excitement. So glad everything turned out alright! Scary! Enjoyed your post, Courtney! Your book sounds fantastic and love the cover! Thanks for your giveaway; please enter me! Wilani, hope things have settled down for you! Thanks Jackie. Just Let Go is fabulous! Best of luck! I love this post! Letting go is a hard to accept, no matter how easy it sounds. Holding on to things always seems to promise a sense of satisfaction, but only churns negative feelings in a continuous loop. Letting go brings freedom and joy and peace that only God can provide. And I'm not perfect at letting go. Nope. I can hold onto to things stubbornly with the best of them. But I'm trying to practice letting go and trusting God with the outcome when I do. I can't wait to read this book! It sounds wonderful. Plus, I'm in love with the book cover. Gorgeous! Thanks for this post, Courtney. There are a couple of these I REALLY need to work on--mainly control and perfection. I'd like to be more spontaneous. I do way too much planning and not enough doing. What a great post. I have issues with all of these things and just seeing them written down reminds me how much they weigh me down. Thank you for sharing this and I agree with Chanel, the book cover is amazing! I so enjoyed and appreciated the post. I think the regrets and control paragraphs are especially difficult. Courtney, thank you for the fabulous post! Congratulations on your release! Thanks for this post. Like Mary, I have those twinges from High School. But it’s been more than 50 years. I do some what-ifs, too! How would my life be different if I had taken another path? But this is what I’ve got. And God has seen me thus far! So all I can do is Trust in Him! The better stuff is coming, anyway! I really don’t have it so bad!